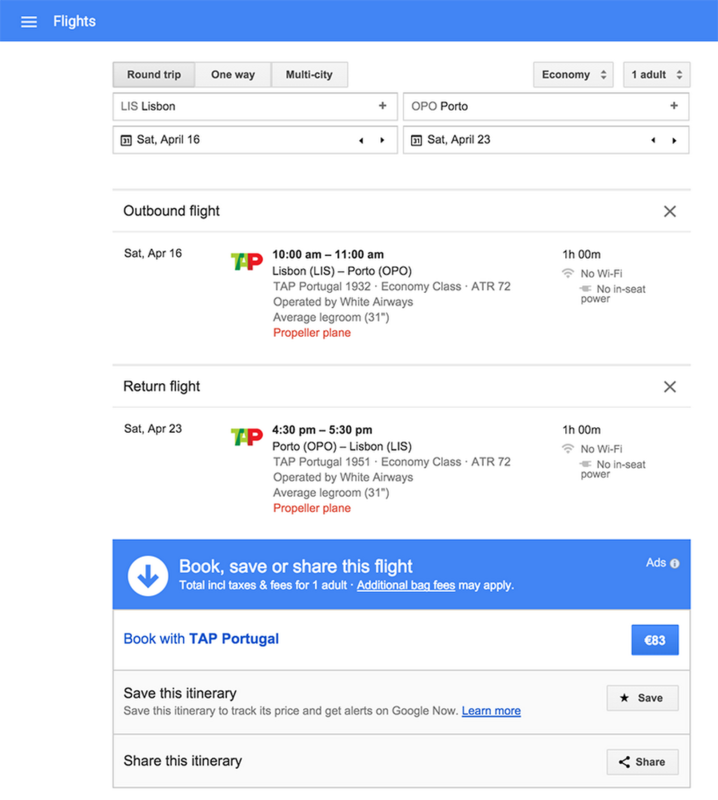 Whether you’re traveling from Lisbon to Barcelona or Porto to Ponta Delgada, Google Flights can offer inspiration and help you find the best flights available. 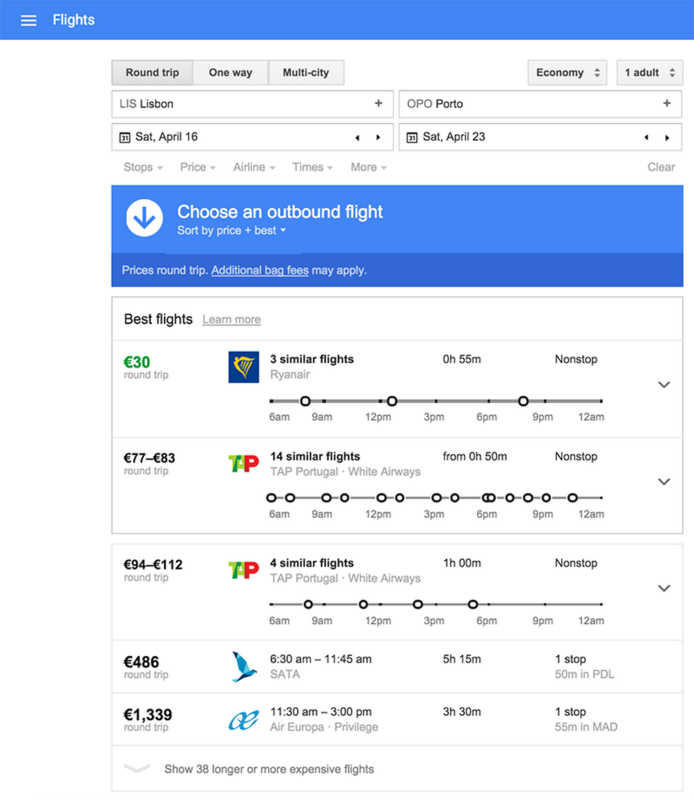 Starting today, you can use Google.pt or www.google.pt/flights to quickly explore, compare and book flights — from your mobile device, tablet or desktop. And you’ll be able to search in Portuguese, see local content, and all prices will default to Euros. 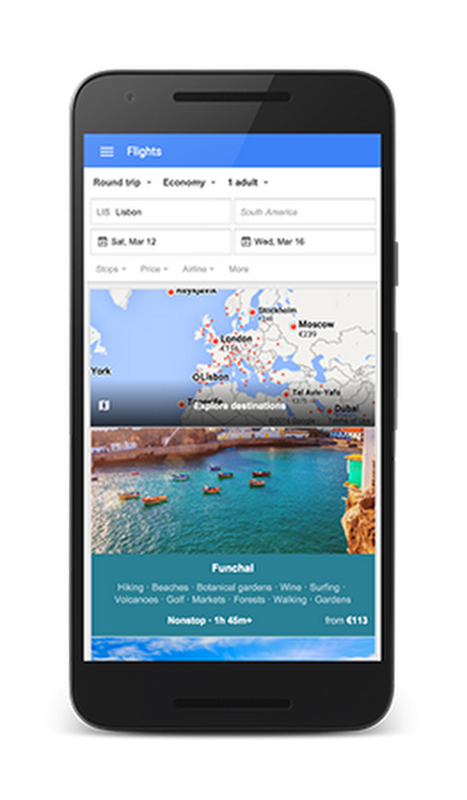 If you’re still trying to figure out where you’d like to visit and the best time to go — try using our new flexible destination search feature that lets you explore based on dates, destinations and interests like: beaches, adventure travel, honeymoons and winter sports. Want to escape the wet, winter weather and head some place warm? Choose “1 week”, “March” and “Islands” to see popular destinations — with the best time to visit those destinations and the lowest price available to get there. Scroll through the suggestions and click on one of the tiles that interests you — you’ll see a snapshot of the least expensive flight and hotel options available (with price, stops and duration for flights — and 5, 4 and 3 star ratings noted for hotels). Another fun and easy way to explore your options is to set your interest and expand the map by selecting “Explore destinations”. 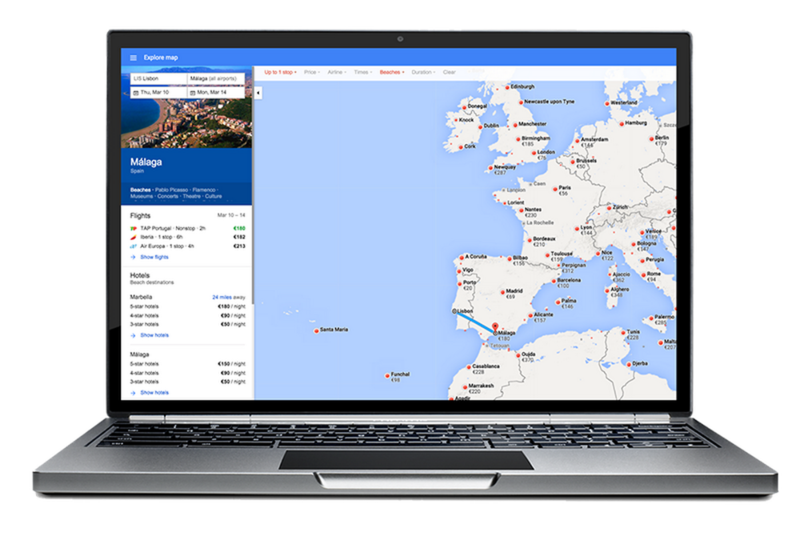 You’ll instantly see live prices for destinations that meet your interest category around the world. You can further filter results based on your preferences and personal budget requirements. Malaga sounds nice — and it looks like you can get there on a nonstop flight in about 2 hours. Once you select your departure and return dates, you’ll be presented with a list of ‘Best flights’; which represents the best tradeoff of convenience and price. 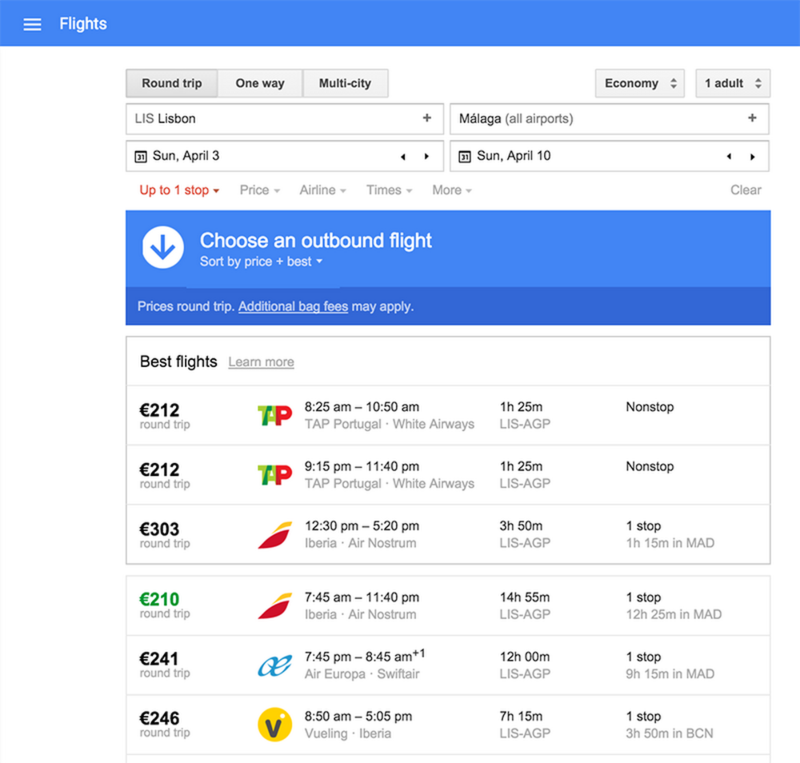 Google Flights can also help you save time when you know where you want to go and when. Let’s say you’re commuting on a popular route — like Lisbon to Porto — that has multiple, similarly priced, nonstop flights daily. Enter your origin, destination and dates and we’ll display all the similar flights available on an easy to scan timeline. They’re grouped by airline, price and number of stops which makes it easy for you to consider your options and book the one that best meets your needs. When you’re ready, simply select your outbound and return flights — and book your flights by clicking on one of the blue partner book buttons. Our goal is to provide you with fast results as you explore where you want to go, figure out the best time to travel, quickly review flight options and book a ticket. 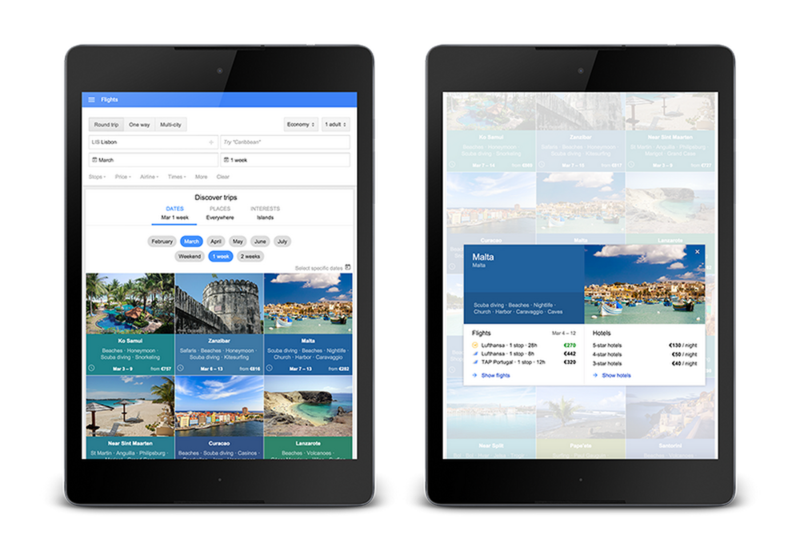 We hope you’ll enjoy planning your next domestic or international trip with Google Flights!